The emphasis on Ray Gridley's work is on functional design that is pleasing to the eye and to the hand. The stoneware pots are individually made, either thrown on the wheel or coiled, while the glazes are chosen for the effect that can be achieved in a gas kiln capable of 'reduction'. The glazes mature at between 1240°C and 1250°C making the domestic ware suitable for both the oven and for dish washers, and giving the garden pots a natural resistance to frost damage. 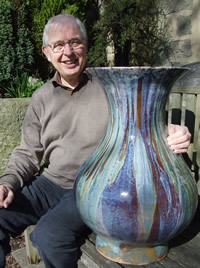 It was Sheffield potter Norman Cherry who got him started when he was driving one of his children to pottery lessons!. Somerset potter Doug Phillips encouraged him to be more adventurous with glazes and inducted him in the mysteries of firing with a living flame. Dauphine Scalbert, who pots near Auxerre in central France tried to discipline his throwing style. 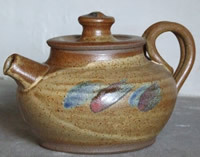 Ray’s distinctive handles on mugs, jugs, teapots and casseroles, are inspired by a Sui Dynasty vase in the National Palace Museum in Taipei.